I met Laure Eve (@LaureEve) briefly last summer at LeakyCon London when I got her to sign an early release copy of her first novel Fearsome Dreamer. On the 7th August the sequel and concluding book The Illusionists will be released. Thanks to Hot Key Books I have had the opportunity to read it already and luckily Laure was on hand at YALC to sign that too. Before we get going I just have to give a moment over to the stunning covers. In the world of FEARSOME DREAMER, England has become Angle Tar – a technophobic and fiercely independent country holding its own against the mass of other nations that is World. Rue is an apprenticed hedgewitch in rural Angle Tar, but she knows she is destined for greater things. 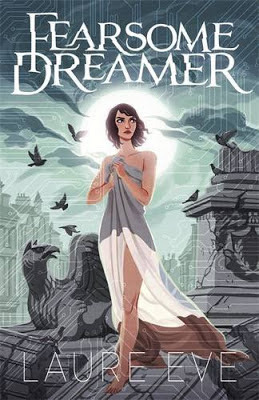 After being whisked off to the city by the enigmatic Frith, Rue becomes the student of White, a young Worlder with a Talent that is much in demand: White is no ordinary Dreamer – but then neither is Rue. Both can physically ‘jump’ to different places when they dream – and both have more power than they know. Rue and White find themselves electrically attracted to each other – but who is the mysterious silver-eyed boy stalking Rue’s dreams? And why is he so interested in her relationship with White? Is Rue about to discover just how devastatingly real dreams can be…? 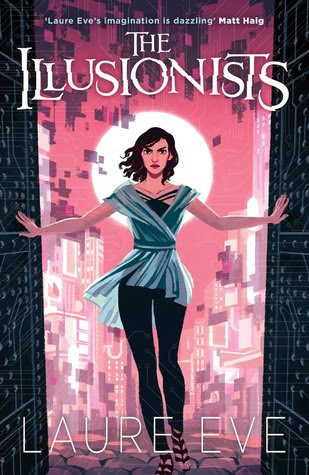 Fearsome Dreamer is told from the viewpoints of Rue, White and Frith who are joined in The Illusionists by Wren and Cho. I asked Laure about this and other aspects of writing the series. Why the decision to add in new POV characters? I felt Cho was needed to give us an understanding of World from a Worlder point of view – from someone so completely, fundamentally caught up in technology. Rue is an outsider to that culture, and she’ll never understand it. But to someone like Cho, it’s hard to even contemplate living without it. It’s the attraction to technology, how incredible it is, how it shapes and warps entire cultures, that I wanted to explore. Wren was interesting. I never set out to say things from his point of view, he just sort of happened. I’m constantly fascinated by villains – especially their motivations. I wanted to understand him better, and I wanted the reader to understand him too. Any advice on handing multiple narrators? I guess the thing you have to watch out for is how you intersperse them. It’s difficult to keep a reader’s attention if you have two similar kinds of chapters following each other, from different characters. It’s good to play around with pace – have a character development or dialogue-heavy kind of chapter from one character, but then follow it with a choppier action kind of chapter from another. What were some of the influences that made you write this story? Direct influences are hard to pinpoint with this one, but I wanted to explore the effect dreams can have on us, as well as the lure I often feel between a love of nature and simplicity, and the thrill of technology. Which one would you choose, if you had to? Can one ever be better than the other? A lot of science fiction writers tackle this subject, and I grew up on a diet of that kind of fiction. Although this story is finished do you think you’ve finished with the world you’ve built? No. I’m toying with the idea of writing some short stories that tie in. It’s difficult to leave the worlds you’ve created completely behind, and there’s always that attraction of getting to play in them a bit more. I guess writing is my way of making sense of the world around me, and trying to formulate coherent opinions on life, existence, death, love, the important stuff. If I didn’t write, I’d feel like I was drifting aimlessly through life. I think everyone finds their own way of making sense of our lives. This is mine. Huge thanks to Laure for her time, I for one am excited we might get some more stories from this world. I also interviewed the five point of view characters and here’s what they had to say. Do you ever wish you’d stayed with Fernie and become a hedgewitch? No. I’d have regretted not taking those chances. You only have one life, so it’s best to live it as hard as you can. If you had to sum up White in 3 words what would they be and why? Stuck up his own behind. Oh, that’s five already. Wait, alright. So, arrogant. Annoying. Beautiful. Can you tell us more about the Talent? What does it feel like? Where do you think it comes from? I believe the Talent is simply a natural evolution of the human self. We are all dreamers. Some of us dream harder than others. Perhaps one day we will evolve to a point where we move through both space and time as easily as breathing. What does it feel like? It feels like that moment when you decide to do something frightening and exhilarating for the first time, just to see what will happen. It feels like that every time. It feels like taking a risk. If you had to sum up Rue in 3 words what would they be and why? Why is she those things? Who knows. The girl is like a force of nature. I cannot pretend to understand her. I simply love her. Oh, it’s hard to describe what she really is until you’ve met her yourself. Let’s just say that she likes secrets. Let’s say she’s quite different to how she chooses to appear. Are you envious of the Talented? God, no. What an awful power to have, and how clever you would have to be to stay one step ahead of the people who would use you for their own ends. Quite a lonely existence, I should think. Do you understand why your brother left World? Doesn’t mean I’ll ever forgive him for being a selfish git, though. So you can never quite understand what I’m thinking, my dear. Eyes are the windows to the soul, don’t they say? Do you ever wish you’d stayed in Angle Tar? About as much as I’d wish to be eaten alive by a bear. At least being eaten alive wouldn’t be so bloody dull. It’s a dreary country, I shouldn’t bother visiting. But I can show you around World, if you’d like? I can show you things you couldn’t even imagine. That sounds like fun, doesn’t it? That’s it folks – If this has intrigued you you might like to know that Laure and Hot Key are currently serialising Fearsome Dreamer over on Wattpad. So far the first 9 chapters are live and you can start at the very beginning here. Please do leave your comments and questions below. *apologies for the formatting – I had issues. This post is part of the Countdown to the 7th August Blog Tour once again organised by Jim Dean (@YAyeahyeah). Tomorrow Big Book Little Book will be hosting an interview with Emma Carroll. Posted on July 24, 2014, in Author Interviews and tagged countdownto7thaugust, Countdownya, Fearsome Dreamer, Laure Eve, The Illusionists. Bookmark the permalink. Leave a comment.